3x5', nylon, self sleeved with leather tab for displaying on outdoor banner pole, features sewn stripes and embroidered stars, made in USA. 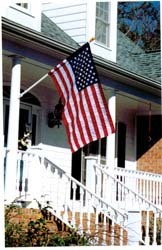 Use the 3x5' outdoor sleeved flag on a 6' outdoor banner pole. This is the largest size for displaying off the side of your home. Great for areas that are not limited in terms of space.